STEPHANIE RAWLINGS-BLAKE, MAYOR OF BALTIMORE: We need the broader community to be engaged. 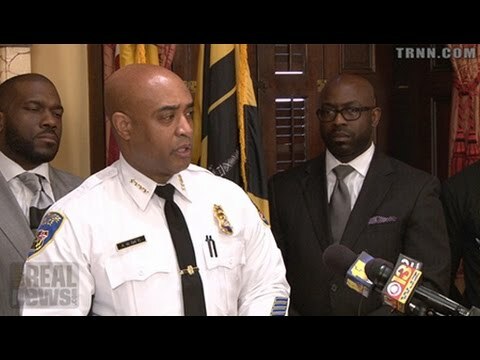 STEPHEN JANIS, TRNN: In Baltimore City, the consensus on how to reduce crime appears to be changing, and with it, alternative explanations for why violence is so stubbornly persistent. BRANDON SCOTT, BALTIMORE CITY COUNCILMAN: It’s not just about drugs and guns anymore. It’s about stupid stuff. It’s about as, as our good brother David Miller says, [da derange]. JANIS: Gone are the days of calls for crack dials or hiring more police among public officials. Instead, it appears Mayor Stephanie Rawlings-Blake and other city officials are starting to look beyond the criminal justice system for solutions. MAYOR BLAKE: My goal is to convene community leaders and experts, and let us all work together to discuss what’s working. JANIS: Which is why Monday the mayor announced plans to engage young African-American men on the subject of violence by enlisting business leaders and clergy to help. MAYOR BLAKE: We will begin recruiting men committed to making a difference in the lives of our children to serve as mentors, volunteers, tutors, job training coaches, speakers and so much more. JANIS: These type of programs are not entirely new, but what is is the subject that appears to be driving the mayor and other political leaders to even explore community engagement: race. SCOTT: I’m a young, black man in America. I know that racism still exists. I know that every day when I wake up I have to be ten times better than my white counterparts in the same age group. JANIS: And more specifically, racism within the criminal justice system itself. In the past, it’s a topic that has been off limits, particularly at the height of the city’s zero tolerance policy, when the police department illegally arrested tens of thousands of African-Americans. But since the shooting of unarmed teenager Michael Brown in Ferguson, Missouri by a white police officer, and the subsequent report from the Justice Department outlining racially biased policing in the town, the topic is finally being discussed at City Hall. BALTIMORE POLICE COMMISSIONER ANTHONY BATTS: We still have young men who look like me being shot by young men who look like me. Among the most vocal is, oddly, Police Commissioner Anthony Batts, who at the President’s national forum on policing last month, characterized Baltimore as a city with a, quote, “1950s-style racial problem.” At the press conference Monday, he elaborated on those comments for the first time, linking crime and the pain of discrimination in a way that few top police officials do. BATTS: If a child doesn’t have hope, if a child doesn’t think that they can succeed or they’re on an even playing field, that comes out in different ways. It manifests itself in different ways. Sometimes it manifests itself in turning towards violence. JANIS: But some community activists are sceptical about both the timing and sincerity of the discussions. DAYVON LOVE, DIRECTOR OF PUBLIC POLICY, LEADERS FOR A BEAUTIFUL STRUGGLE: We’re socialized to feel that it’s normal to be in a social context that doesn’t recognize our fundamental humanity. JANIS: Dayvon Love, one of the founders for the Leaders for a Beautiful Struggle, says reluctance to discuss racism in criminal justice in the past points to systemic failures of the political process itself, where candidates are tied to a system that benefits from it. LOVE: We have corporations, mainsteam institutions, that finance individual black people to serve as, representationally, the folks who represent our interest. And so what happens is it pacifies the masses in many ways, because they put a black face, and so it creates this kind of symbolic notion that there is progress or there’s equity. SGT. LOUIS HOPSON, BALTIMORE POLICE DEPARTMENT: You need jobs, not jails. JANIS: It’s criticism even some police officers admit has merit. Sergeant Louis Hopson was the lead plaintiff in a landmark federal civil rights lawsuit against Baltimore City Police Department, which resulted in a $5 million settlement. SERGEANT LOUIS HOPSON, BALTIMORE CITY POLICE DEPARTMENT: We’re not providing good job opportunities, so the racial divide is real. JANIS: During his nearly two decades battle with the city, Hobson says racism flourished, and people in the community suffered, which is why he says a rhetoric over racism lacks meaning if it doesn’t result in substantive change and better opportunity for the black community. HOPSON: I think you have to start thinking about things like restorative justice, in a way you restore people’s, that’s been damaged by racism. That goes for the citizens as well as in the police department.